Hazel Farris was a beautiful woman in life. She was beautiful and notorious. Hazel was born in Bessemer Alabama, but she was a fast living woman and ended up in Kentucky with a hard drinking husband by the time she was twenty-five. Hazel and her husband both drank heavily and they were known to exchange blows from time to time. One night, one of their fights got out of hand. Hazel grabbed the pistol and shot her husband three times. The neighbors called the police and three police officers entered the house. Three more gunshots pierced the night. Reinforcements were sent and before the night was over five officers had been killed and Hazel had fled into the night. Hazel ran home to Bessemer where she managed to avoid arrest despite a reward being posted for her capture. In Bessemer, Hazel got a job and went on with life. She fell in love and in the heat of her passion, she confessed her crimes to her lover. Her lover was terrified by her confession and immediately turned Hazel in. Hazel was mortified and heart broken. She could take no more so she got completely intoxicated and took as much arsenic as she could get her hands on. 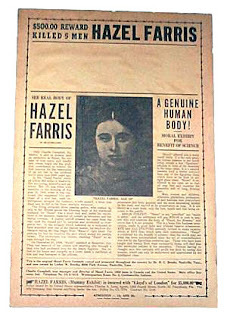 Hazel died in 1906. Hazel's corpse was taken to Adams Vermillion's furniture store and funeral parlor. Since no one claimed Hazel's body, Adams placed her corpse in storage. After a few months, Adams noticed that Hazel's body was beginning to mummify. It is believed that she began to mummify because of the combination of arsenic and alcohol she used to end her life. Always one to make the best of situation, Adams began showing the modern mummy for money and eventually her body was sold. After changing hats and going across the country in various sideshows as an oddity, Hazel's body eventually came to the Bessemer Hall of History. 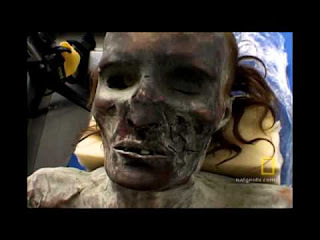 The mummy was displayed there from 1974-2004 and many believe that this is where Hazel's ghost lives on today. There have been reports of lights going on and off in the building and strange whistling noises. Visitors have also reported feeling ill at ease at this building. Even thought Hazel's corpse has finally been laid to rest, her spirit walks on giving visitors a new nightmare to keep them up at night.